Picture 4. Royalist Infantry occupy the ground, four regiments up front under Sir Francis Howard and two in the second line under Sir Kenneth Williams. The right wing was left unguarded on the assumption that the River Avon and the town would be too difficult to cross. Picture 5. On the left flank the Royalists placed their dismounted dragoons in Broad Chalke and had to split their cavalry to either side of the village. At the bottom of the picture you can see the Royalist Cavalry commander with his aide who is reading a map upside down which might explain what is about to happen! 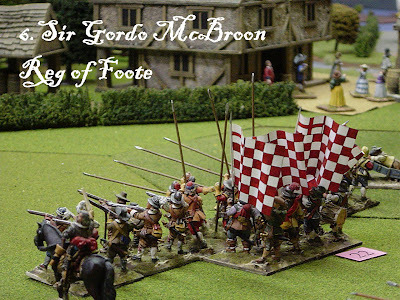 Picture 6 shows a detailed view of one of the Royalist Regiments of Foote – figures by Redoubt and all are 25/28mm. This regiment will route during the battle and lose all its beautiful flags (yes, painted by me years ago) which will be pressed into service by the Parliamentary C-in-C for picnic duties. Picture 7 shows the Parliamentary deployment. 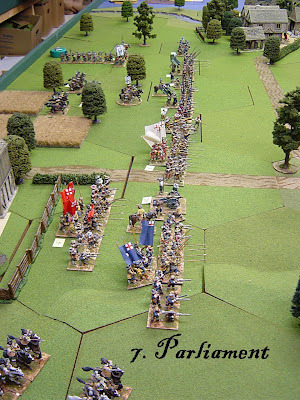 Four regiments up front under Sir William Hague with a regiment in column at the rear aiming to enter Chipping Snodbury with a regiment of dragoons. The right hand end of the line is bolstered by another regiment of foote in case the outnumbered Parliamentary cavalry is defeated. 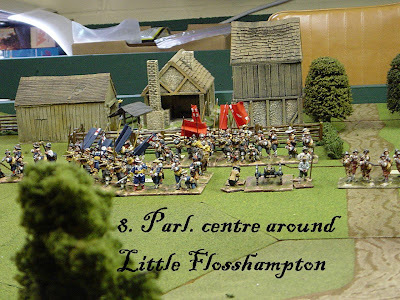 Picture 8 shows the Parliamentary centre around the village of Little Flosshampton. 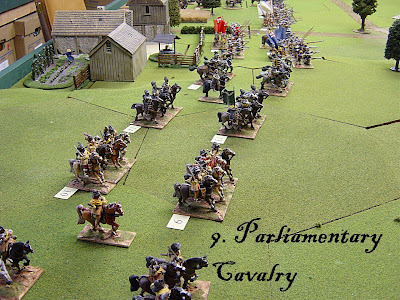 Picture 9 shows the Parliamentary cavalry. We used computer rules (which explains the numbered tags) from Computer Strategies of Australia. A regiment of infantry went in at about 350-400 men while the cavalry were deployed in troops of about 60. The Royalist plan was to assault the enemy centre with the four foote regiments (supported by two more) whilst the cavalry would charge in two blocks around Broad Chalke and slaughter the enemy horse. 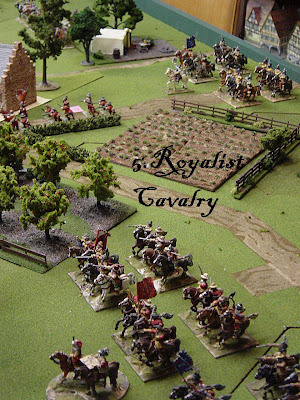 After that the Royalist Cavalry commander, Lord Flynn of Errol, was ordered to roll up the Parliamentary infantry line. The Parliamentary plan was to hold with the infantry in the centre while using one regiment of foote and the dragoons to slip through Chipping Snodbury and assault the undefended right wing of the Royalists. The cavalry, mostly massed on the right, were to do their best to hold off the Royalist cavalry and were told to call on infantry support if necessary. The Parliamentary C-in-C held back two cavalry troops as a personal reserve. Finally, a note on names. Hmmm, well they reflect Political, Sporting and Comedy parts of our English heritage. One of the Parliamentary cavalry generals was Sir Ian Botham and he was certainly about to bowl some googlies.